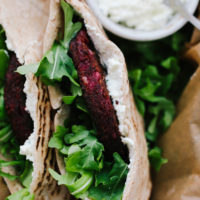 Beet Veggie Burger Stuffed Pita with Whipped Feta | Naturally. During the busy holiday months, I’m always looking for extra quick ways to eat well. It always feels like lunch is my weak area. It’s easy to ditch cooking and head out with friends. But, I feel it when I do. And so, I like to have a few lunches that feel a bit extra but take very little work. This is one of the reasons I love working with Dr. Praeger’s. I know I can keep a few veg burgers on hand for quick and filling lunches or dinners. I love the flavor arugula adds to any sandwich or burger. The baby arugula you find in most stores in mild, with just a hint of pepperiness. This is the version I prefer with this stuffed pita. However, you can also use the spicier arugula you might find at the farmers market. I like keeping a few premade items on hand. In an ideal world I’d make everything from scratch but the truth is, I’m not there in my life. And so, I turn to companies I know use minimal but solid ingredients. 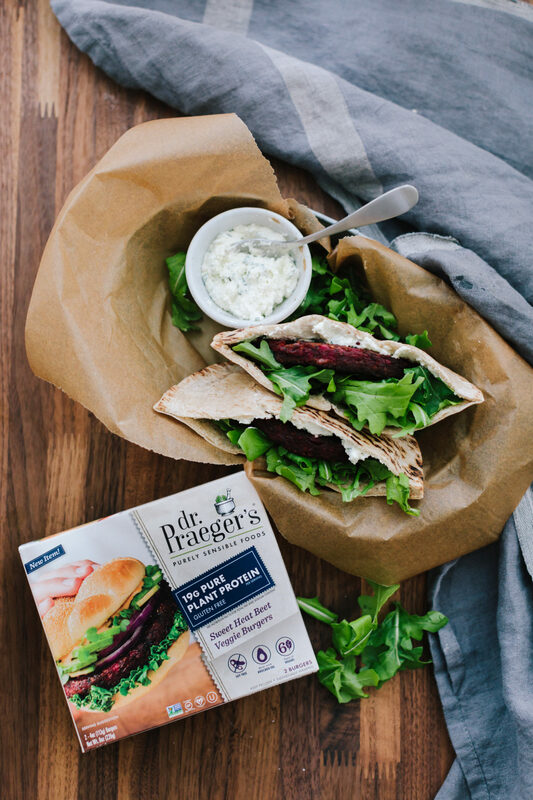 These Sweet Heat Beet Veggie Burgers from Dr. Praeger’s are new and now one of my favorite options. They have a good flavor, six types of veggies, and have 19g of protein in one patty. Plus, they are vegan and gluten-free. 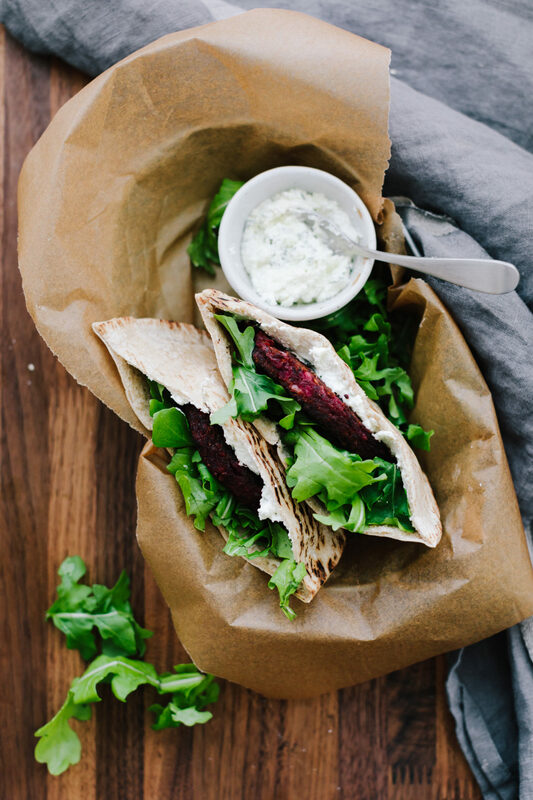 Obviously, using feta is a no-go if you want to make this vegan. However, since the burgers are vegan, I want to give you an alternative. You could use a vegan feta but frankly, it’s more work than it’s worth. I’d recommend going with a nice layer of hummus instead! Finally, if you want to ditch the pita: turn this into a salad. Cooking up a veg burger as salad topping is one of my favorite things to do. It’s an easy way to make a filling salad without reaching for a ton of ingredients. In a small food processor or blender, combine the feta and yogurt. Pulse to combine then add in the lemon juice and parsley, pulsing a few more times. Alternatively, place the feta and yogurt in a bowl and stir/mash until well combined. Add in the lemon juice and parsley. 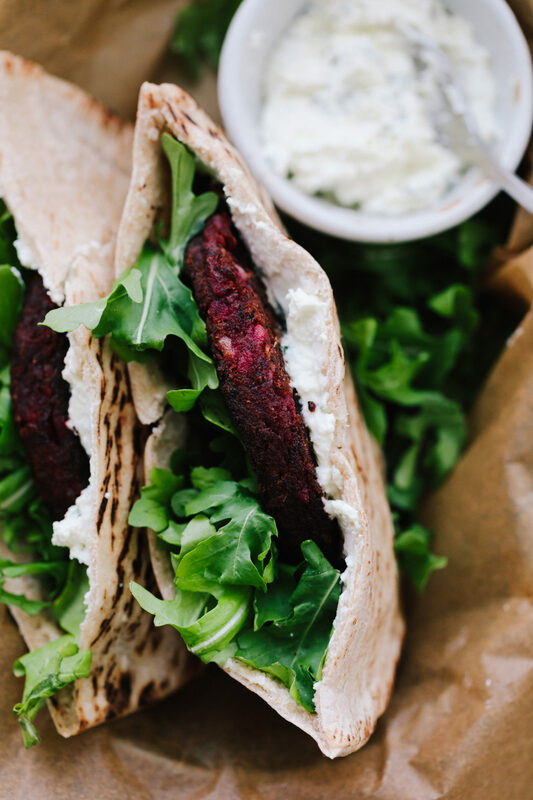 Cook the beet veggie burgers according to the package. Once done, slice in half. Warm the pita slightly over a gas stove flame or in a dry skillet. Slice in half and spread 1 to 2 tablespoons of the whipped feta on the inside of each pocket half. Place one half of each veggie burger in the pocket and finish by stuffing the arugula on one side. Serve immediately. This looks delicious. I might even be able to sneak this past the kids using the premise of a ‘burger’ !! !